Caroline M. Mootispaw is pictured with defense attorney J.D. Wagoner in Hillboro Municipal Court on Thursday. A case of breaking and entering that was first filed in Hillsboro Municipal Court almost a year ago will go before a grand jury. Caroline M. Mootispaw, 24, Washington C.H., appeared on the fifth-degree felony Thursday. Court records show the charge was first filed on June 20 of last year. An affidavit filed with the court states that a deputy investigated a call that the window of a local business “had been busted out.” The alleged victim reported that it seemed “someone had (come) in and went through the drawers and taken some loose change,” according to the affidavit. A review of surveillance footage allegedly showed “a male and female enter the business at the time described by the (alleged) victim,” the affidavit states. The affidavit adds that the alleged victim “immediately identified the female as Macey Mootispaw.” She reportedly could not identify the male. A warrant was issued for Mootispaw’s arrest last year, records show. She appeared on that warrant last week, and her case was set for a preliminary hearing. A $2,500 bond was also set on a probation violation from a 2013 conviction for possession of drug abuse instruments. On Thursday, Mootispaw appeared for her preliminary hearing, which she ultimately waived. Her bond on her probation violation was reduced to her own recognizance (OR). When asked, Mootispaw said she had been in custody for 12 days. 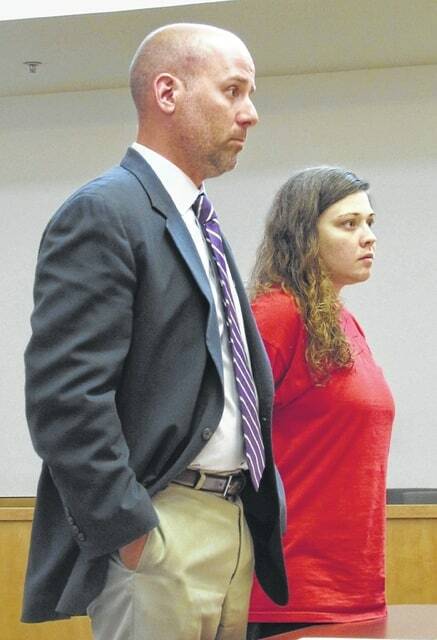 Hillsboro Municipal Court Judge David H. McKenna said Mootispaw has 33 days left to serve on her probation violation. That sentence is set to be reviewed in August. McKenna further reviewed Mootispaw’s record, saying that jail time had been imposed and furloughed and that warrants had been issued for her arrest since her 2013 conviction. He added that since then, Mootispaw had also been under indictment in Greene County. Mootispaw told the court that she successfully completed an intensive drug and alcohol program in that county. McKenna also said that reporting probation will give Mootispaw’s attorney an argument for community control if she is convicted of breaking and entering. He said that if she is convicted a presentence investigation will likely be ordered to see if she is a candidate for community control. “And right now … you have failed miserably,” McKenna said. In other cases, Gary Buchanan, 47, Hillsboro, entered an agreement on a first-degree misdemeanor charge of operating a vehicle under the influence (OVI) and a minor misdemeanor charge for an open container. An affidavit filed with the court states that Buchanan was charged after a deputy with the Highland County Sheriff’s Office arrested a different individual for OVI. Buchanan was reportedly the passenger. At that time, the deputy allegedly found an open bottle of beer under the seat, and Buchanan was charged with an open container violation, the affidavit states. Buchanan was then transported home by a different deputy, according to the affidavit. Later that same evening, the first deputy was advised that Buchanan had “arrived at the sheriff’s office around 12:35 a.m.,” the affidavit states. The affidavit adds that Buchanan “was currently passed out in the lobby.” The deputy then “awoke (Buchanan) from his slumber,” and asked him why he had driven to the sheriff’s office intoxicated, according to the affidavit. Buchanan allegedly said he was there to pick up the other driver “because she needed a ride” and “there wasn’t anyone else available” to pick her up,” the affidavit states. Buchanan was then charged with OVI. The vehicle he allegedly drove, which was registered to a shipping company, was secured, and the company was called. On Thursday, Buchanan pled guilty to an amended and reduced charge of third-degree misdemeanor reckless operation. The state recommended a suspended sentence on the condition that Buchanan complete a three-day driver intervention program. The judge followed that agreement. A 60-day jail sentence was suspended. Buchanan must pay a $500 fine. Four points will be added to his driving record. His open container charge was dismissed. Also on Thursday, Sonya Cox, 33, Greenfield, appeared on a bench warrant that was issued earlier this month. According to records, Cox was convicted of first-degree misdemeanor theft last year. Records add that she has had jail sentences imposed and furloughed at different times. She has also had the opportunity to complete the day-reporting program. On Thursday, Cox’s furlough to the day-reporting program was revoked, records show. The remaining 36 days on her sentence began when she was arrested Wednesday. Appearing for an arraignment was Paul Harlow, 27, Hillsboro. The Times-Gazette previously reported that Harlow pled no contest to two counts of first-degree misdemeanor child endangerment in March. He was found guilty. Both Harlow and Luckett were sentenced to 90 days in jail, with an additional 90 days suspended. On Thursday, Harlow appeared on a new charge of theft, records show. A pretrial is set for July 17. His bond was set at his own recognizance. Records add that Harlow is under the supervision of the probation department and is on electronic monitoring house arrest.